For 4 days in a row a gull has been observed on the top of the seawall at the 1300 block of Alki Ave feeding on a recently caught flounder. Now this may or may not be the same individual gull, but it looks like it might be and is certainly the same species. It's quite possible that one gull has found a perfect place to catch flounder and is in a perfect groove. Due to foot and dog traffic in the area I was only able to get images of the gull feeding one of the days as it kept moving as it was spooked by traffic. Today was the break in the chain of feeding days and for good reason. A strong high pressure system has entered the area with strong north winds....pushing high tide surf against the seawall and making it an impossible place to fish for flounder. 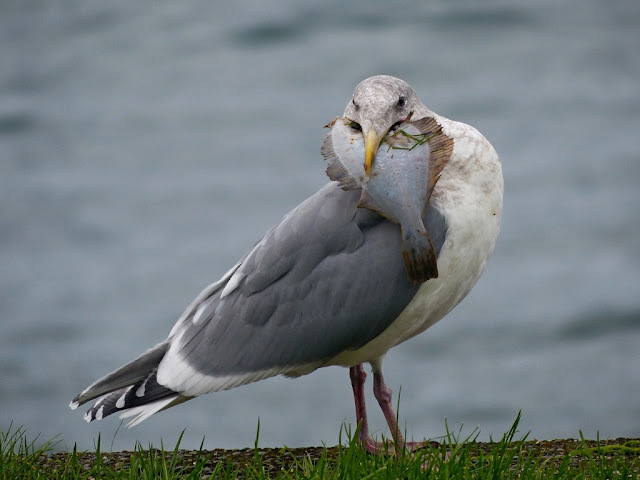 Perhaps when the wind calms down the gull will be back and with more flounder.